It's summer time again. All our kids will be at home enjoying the holidays. We Mothers will also have a good time because we get to spend a lot of time with the kids during the daytime as well. While it feels happy, most of us will have also lot of anxious time worrying to keep them safe. While it is easy to keep the kids off the visible harm like knives, electrical items etc., it is much more difficult to keep them safe from invisible harm like Cockroaches and the food- contamination they bring along with them. These Cockroaches carry germs and bacteria, come behind the back, crawl on food and utensils, contaminate food and spread Food Poisoning. While family members and guests suffer, kids who touch everything from floors to small articles, they are the first ones to get this infection. Hence, it’s very important to eliminate hidden cockroaches from the kitchen and house. We have to understand that Cockroaches are no Passovers. They easily escape the usual and monthly cleaning by hiding in hard to reach corners like under the cylinder, sink, cracks and crevices. Hence there is no better option to keep the Cockroaches away than deep cleaning the kitchen by cleaning the kitchen and house regularly. Whenever I deep clean my kitchen as part of my monthly chore, the simple, handy and reliable solution I use is LAL HIT! LAL HIT is the only solution that can eliminate the hidden cockroaches completely. It comes with a Deep Reach Nozzle that can get onside deep corners, cracks and crevices. LAL HIT is simple habit which can avoid food poisoning at home. Moreover, LALHIT now comes with a fresh fragrance. 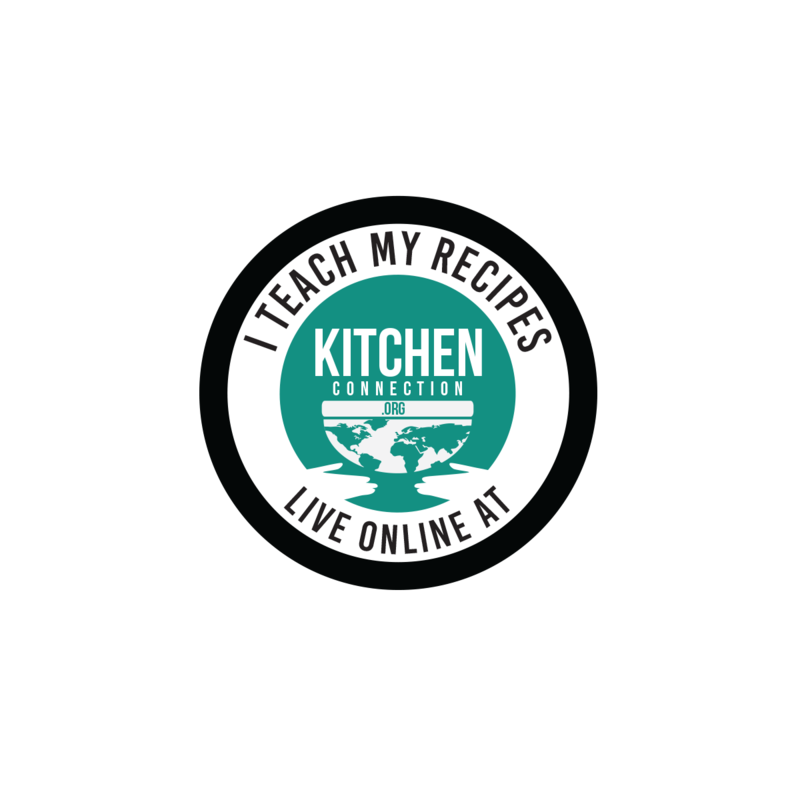 Now It is today’s Recipe time. And I have a sweet one for you. Have you taken a sweet which is a frozen? 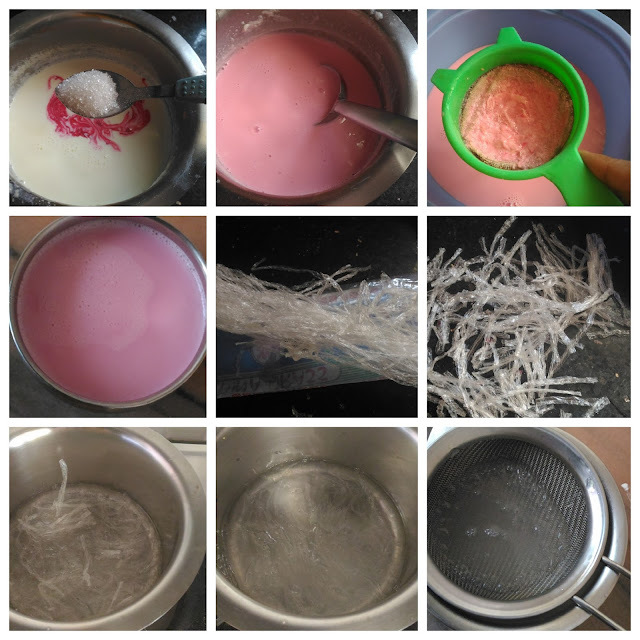 Rose Milk jelly is one such recipe which will make both kids and adult drool. For summer its a great dessert to be make at home with common ingredients. 1. Add milk and sugar in a bowl. Mix them well till the sugar dissolves completely. 2. Then add rose essence and mix them well. 3. Now strain the milk using the strainer and pour it into the (bowl) mould. Keep it aside. 4. Take 5 gm of agar agar and cut them into small pieces. 5. In a bowl add 200ml water and agar agar pieces. Bring them into boil. 6. Cook them till the agar agar melts completely. This process took 10-15 mins. 7. Then strain the agar agar syrup using the steel strainer. 8. Mix this syrup (from 7) with rose milk syrup (from 3). Mix them well and keep it in the refrigerator or at room temperature for 2 hours or till they become set well. 9. Now cut it into desired shapes and serve. 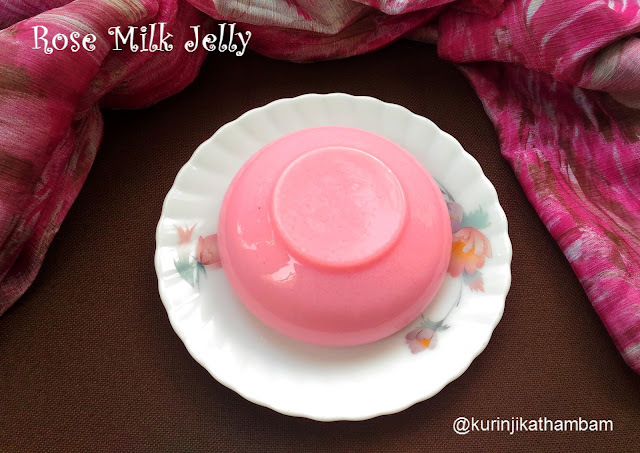 Yummy and tasty rose milk jelly is ready!!! 1. 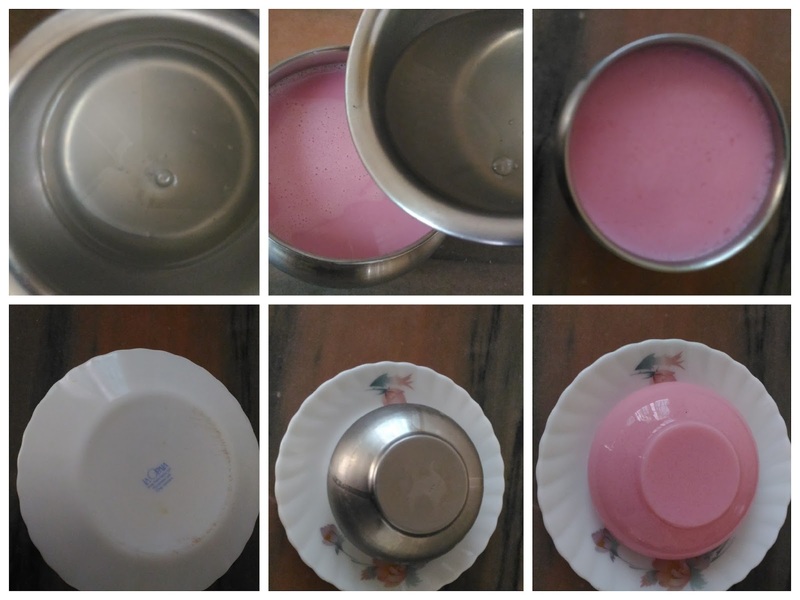 Once the agar agar syrup is ready, then immediately mix it with the rose milk. Otherwise the syrup becomes thick. Yesterday I did my monthly Deep Cleaning Routine for my kitchen. 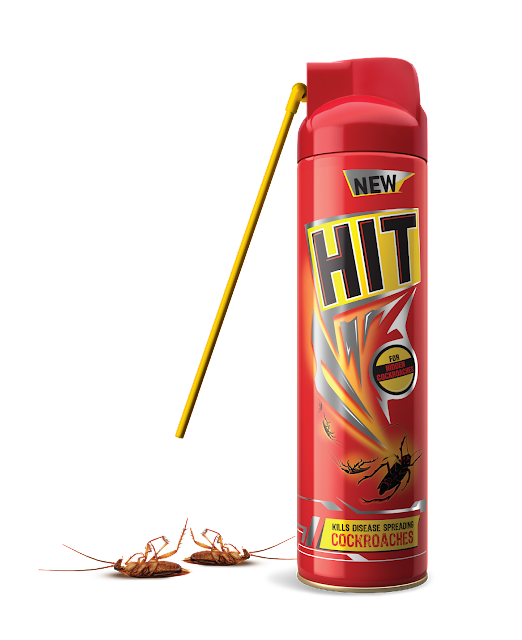 I used LAL HIT to clear the sink, cracks and corners of my house. I liked the new LAL HIT's fresh fragrance spread across my house after the deep cleaning.